I saw the Goody Spin Pins on a Youtube tutorial a couple of weeks ago and can't for the life of me remember who's channel it was on! Of course, they're useless to me now that I have the short locks, but I knew my sister (who has long hair down to her bum) would love them. I watched the tutorial and then promptly forgot about them. Until we were in Claire's Accessories yesterday with our two little cousins. We took them shopping and they had a few euro left each to spend, so while they looked at every single item in the shop, we had a little squizz ourselves. These are spiral clips that you twist into your hair if you are putting your hair into a bun. 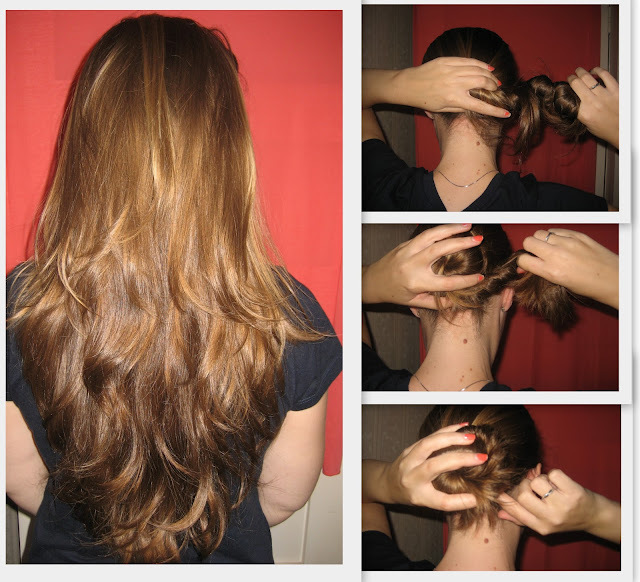 You don't need a ponytail grip or *whisper* a scrunchie! When I had longer hair I always had my hair in a bun and kept it put with a bobbin that I'm sure wasn't great for my hair. My sister Joanne suggested I photograph them beside something to show you how big they are and couldn't really understand when I whipped out a lipstick, this being a beauty blog and all! You start off with lovely long hair like Joanne (haircut is courtesy of Christian from Brown Sugar)! Twist your hair into a bun as you would normally. 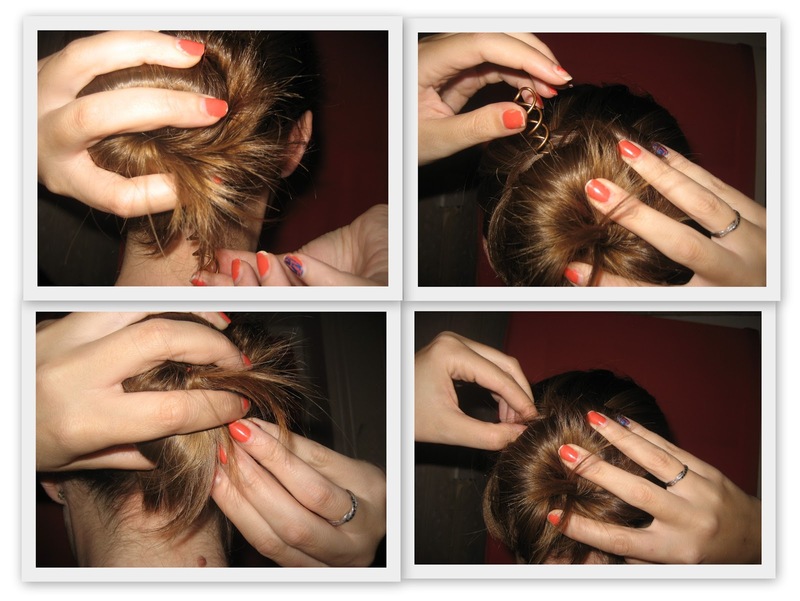 Starting at the top left picture, you grab one of the Spin Pins and twist it clockwise into the thick part of the bun, until it doesn't twist anymore (bottom left). You then take the other Spin Pin and position it so that it's opposite in direction to the first one (top right) and twist it clockwise again until you can't anymore (bottom right). It's important that you don't have them too close together or they'll twist around each other and interlock and then you're on your own trying to get them out! 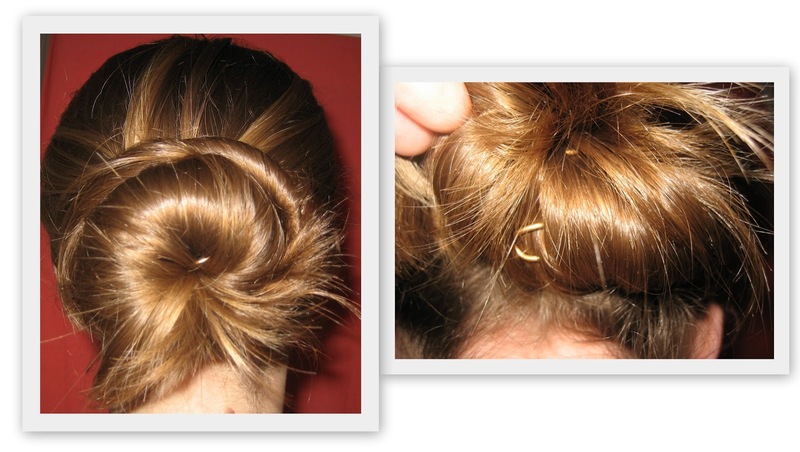 You will be left with a bun that looks like it's sitting proudly on it's own :) The photo on the right shows the pin and how secure it is. When you want to take the bun down, simple twist the Spin Pins anti-clockwise and you're done and dusted! Joanne said that her bun felt really secure with these pins in and that they were comfortable, didn't pull her hair and didn't hurt. Result! I bet they'd be lovely with a low side bun. You can pull the hair in the bun to make it look messier and tousled. Now I want long hair. They were €6.95 for two Spin Pins in Claire's Accessories. Has anyone given them a go? I want hair that long! Its so healthy looking! Those pins look like a great idea! Never heard of these before but will give them a go if I see them. btw love you sister's nails! Im shocked at how quick and easy they are to use... especially that someone like me can use them with no problem. Also expected the hair to get caught around them which didnt happen! Deffo my new favourite thing!! Oh wow! They look great - I wish I had long hair now! PS. Your sister's hair is lovely! These look great. Nice post. Must tell bff about these she will love them. Those are so cool! Jealous of her hair!! Oooh, I saw these advertised on TV today and was intrigued! Thanks for this post. I saw a previous comment you made in that your sister does nothing too it....I think most people with long hair are low maintenance otherwise they wouldn't let their hair grow so long. Mine dries straight naturally, if it didn't then mine definitely wouldn't me as long as I have it. That looks like a great little doo-dah, my hair is pretty short at the mo so they wouldn't work for me. My sister would love them though. I must keep an eye out for them. I may keep dreaming I suppose! I saw those in Asda but wasn't sure about getting them, I don't wear my hair up much, but maybe these would change my mind! @ScienceGeek - that's very true re people with long hair, wish I had the willpower not to do anything to mine but I bet I'll have changed the colour again by the end of the year! @objectsofmyaffection - I think everyone is in love with her hair and she thinks its hilarious hehe She said it makes her want to actually take care of her hair now!